I have previously mentioned why risotto has sentimental value for me. If you have no idea what I’m talking about, please do read my post, here it is. 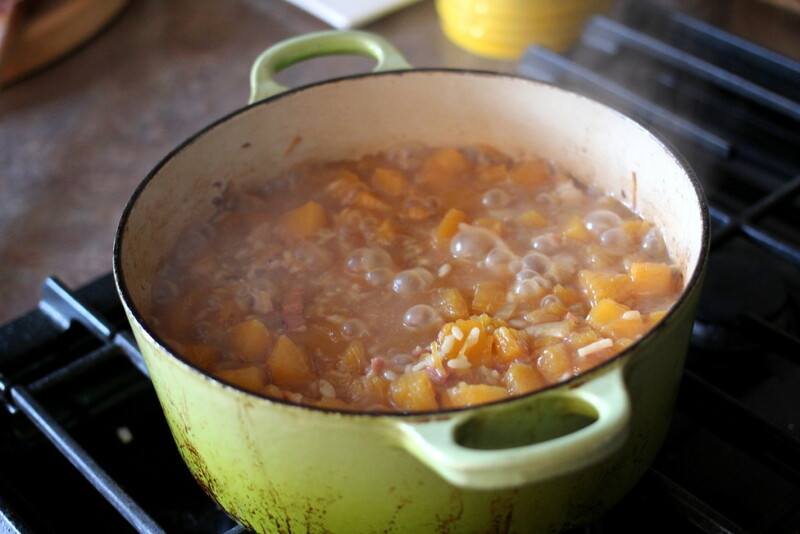 The perfect risotto is often perceived as a labour of love where you slowly add the stock, stir, wait for the stock to be absorbed, and then add more stock. 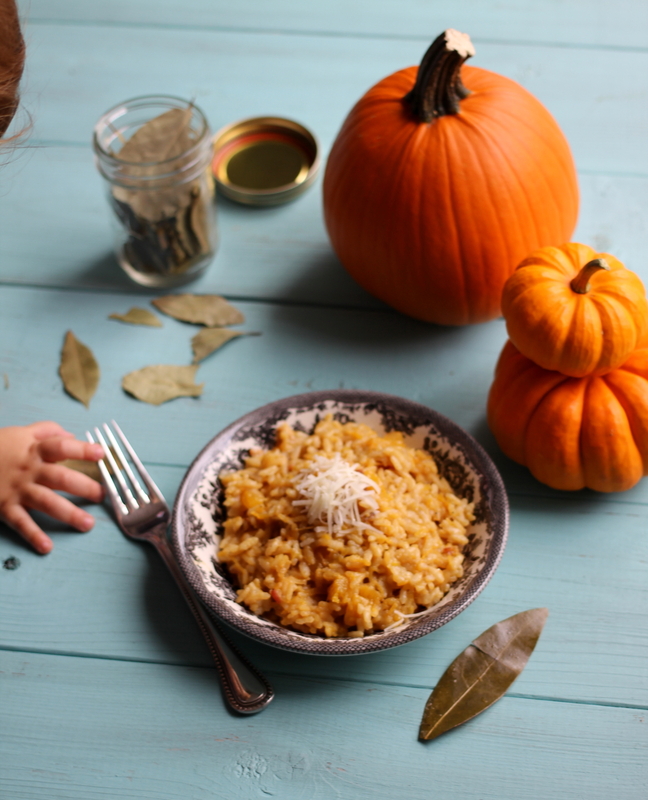 This is how I always made risotto…before I had kids. Now, dinner time is crazy-time in my house; I have a 4-year-old screaming at me about wanting a snack and a 1-year-old trying to climb my legs. The tranquility I used to experience in the process of making risotto has gone away…far, far away. Making dinner has to be simple these days and there has to be opportunities for me to walk away from the stove and deal with my boys. I love this recipe, not only because it is really simple and delicious, but you are able to walk away from the stove for 15 wholeminutes! Imagine! 15 minutes where you can do whatever you want. So, kick back, relax and throw your kid a snack. Let the risotto become perfect all on its own. 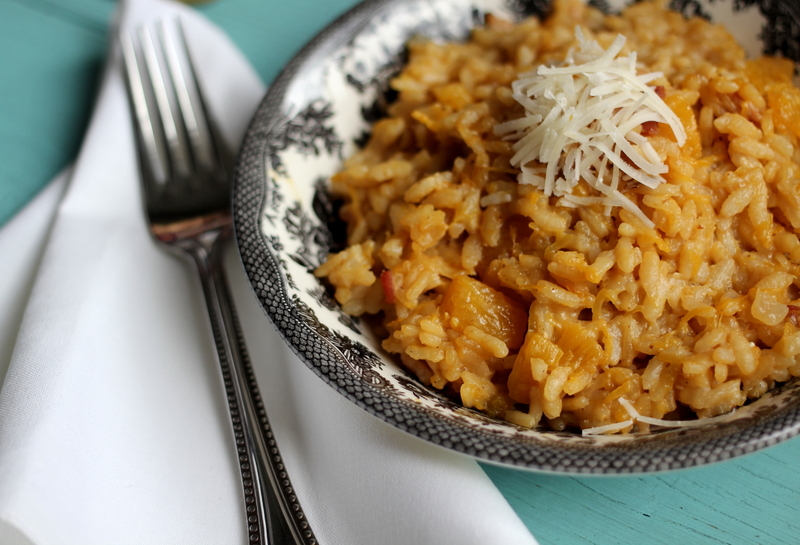 This is a recipe for self-sufficient risotto, right here – an easy meal at its finest! In the event that you are just so darn curious about what’s going on under the lid, I’ve provided a peak into what the risotto looks like during the cooking process. Nothing exciting, right? Well, it is pretty exciting to know that a perfect dinner is minutes away so I don’t blame you for wanting to take a peak. 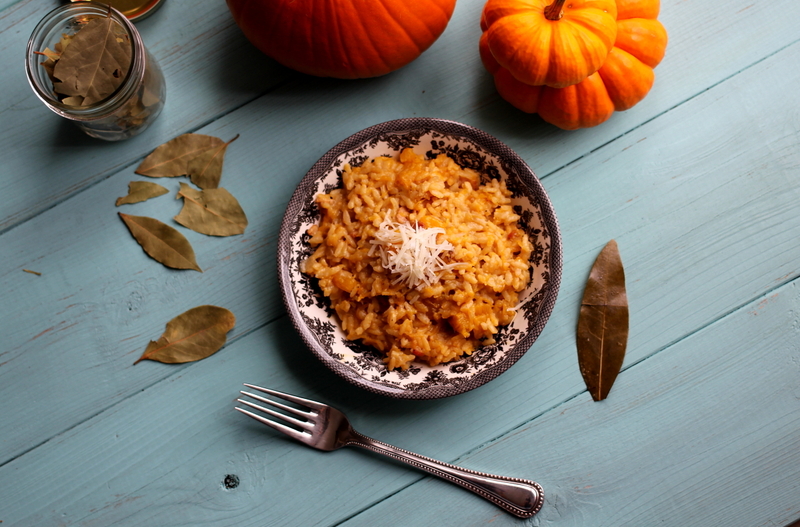 I used cubed roasted pumpkin in this recipe but this recipe is versatile. Feel free to try it with mushrooms, squash, asparagus, or even just plain risotto. What I like about this dish, too, is that the entire family loves it. Even my 1-year-old picky eater enjoys eating it! I am always thrilled when I can make one dinner that everyone can eat. 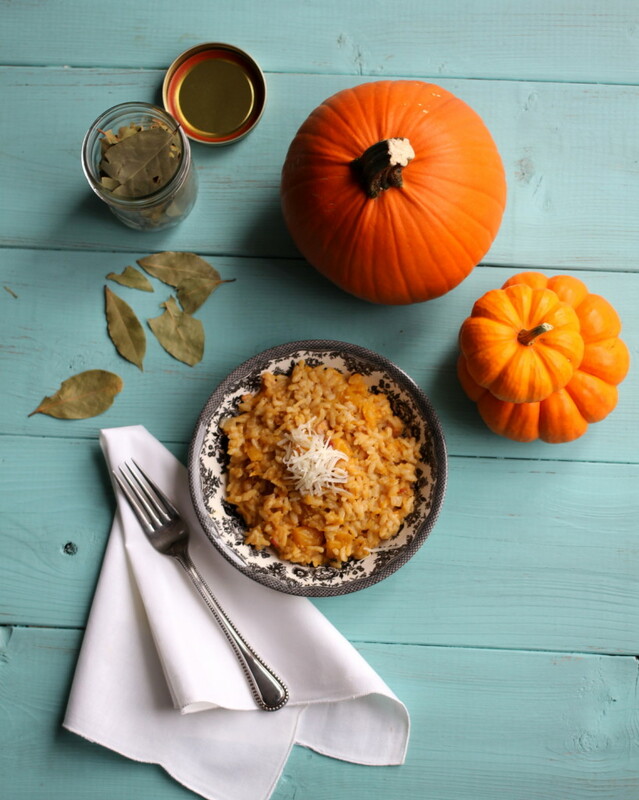 Here’s another little secret for you: Pumpkin and Bay leaf together make the pumpkin taste even more like pumpkin. True story! 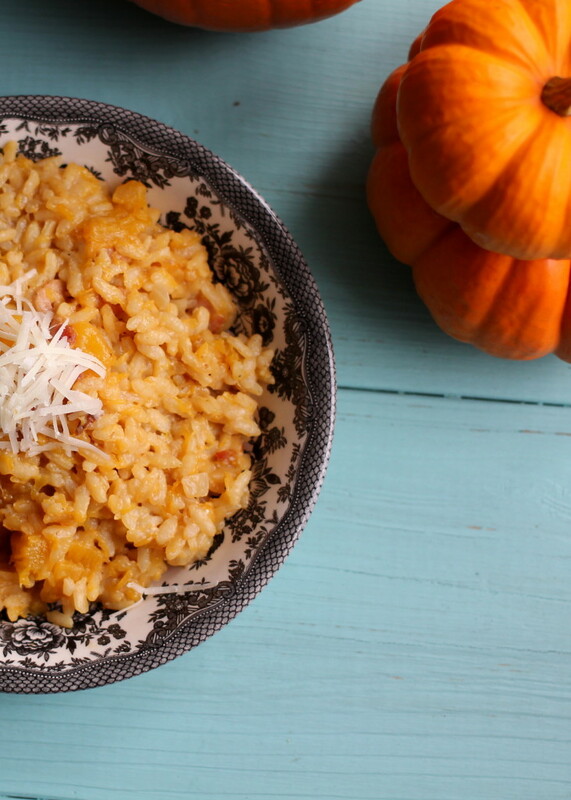 I add it into this pumpkin risotto and it gives this dish another dimension of flavour. Be sure to remove the bay leaf after the risotto is finished cooking as they are very woody and inedible. I use cubed, roasted pumpkin in this recipe. If you’ve never roasted an entire pumpkin before (I’ve never roasted an entire pumpkin until now) I’ve included a recipe below. 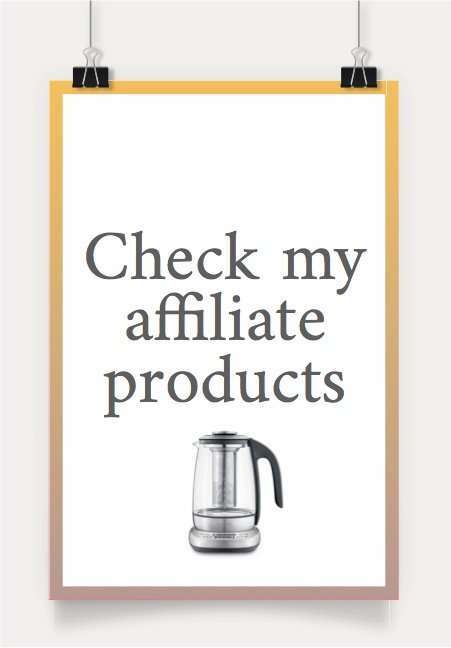 It’s super easy – give it a try! Yes, you literally put the entire pumpkin in your oven! Here are some photos just to show you that the struggle is real when it comes to producing this blog with a toddler at home. Little D always wants his little hands (and feet) in whatever mom is doing. I had to cut this shoot short and finally feed the kid. He clearly couldn’t wait! That brings me to my next point that risotto is best when eaten immediately. If there are any leftovers, and I use that term loosely, you can create arancini (fried rice balls) with them by forming balls with the rice, and then coating them in flour, then egg, and lastly breadcrumbs. Fry them up in some hot oil and you have officially re-invented leftovers! Here is the official recipe for Leftover Risotto Arancini. I hope you enjoy your 15 minutes of serenity! I know I do and I wish I could make this dish every single night. Rinse off your pumpkin, then use a fork to stab the outer shell a few times, to allow for ventilation. 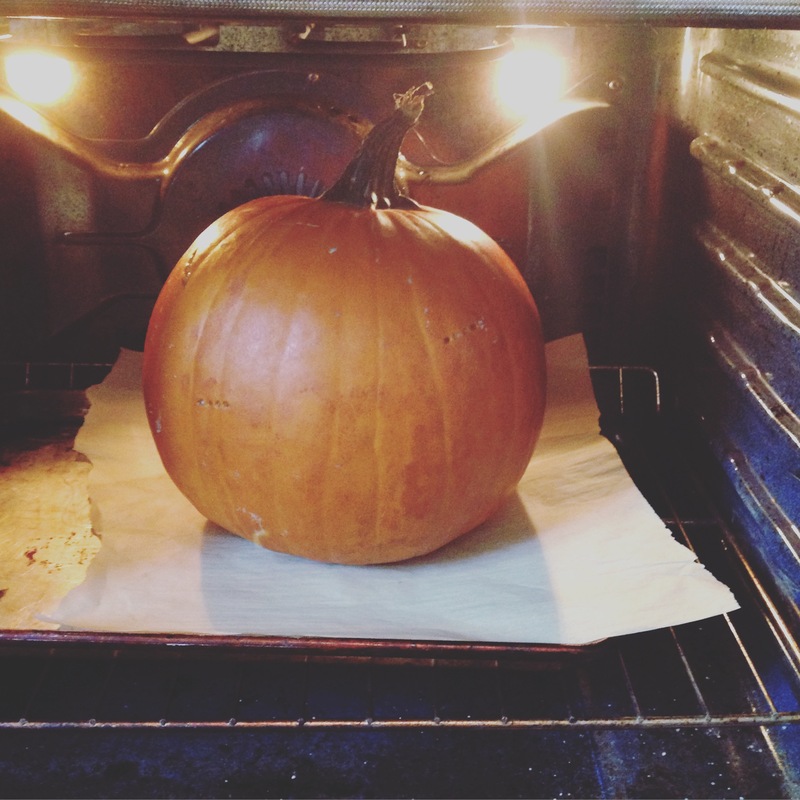 Place the whole pumpkin on a parchment lined baking sheet, and transfer to the oven to roast for 60 minutes (for a medium sized pumpkin). You will know when the pumpkin is ready when the skin is darker, and the flesh can be easily pierced with a fork. allow to cool for about 15 minutes or until cool enough to handle. Cut the pumpkin in half over the sink (water will pour out of it). Use a large spoon to scrape out the seeds, and reserve them for another recipe. Remove the skin (it will peel off easily with your fingers or use a pairing knife). Then, chop the pumpkin flesh into ¾ inch chunks. Set aside until ready to use or refrigerate in an airtight container for up to 3 days. Heat olive oil in a heavy bottomed saucepan on medium-heat. Add bacon, onion and garlic into the pan and sauté until the bacon is crispy and the onion is transparent. Add pumpkin and sauté for 1 minute then add rice and toast for another minute. Add in your stock and bay leaf. Gently stir all of the ingredients together being sure to scrape the bottom bits as well. Set the heat to medium-high, cover the pot with the lid and let cook for about 15 minutes or until the rice is tender and the liquid has been absorbed. Shut off the heat and carefully remove the bay leaf and add the Parmesan cheese, combine. Divide the risotto among four bowls. Grate more Parmesan cheese on top of each serving and serve hot. 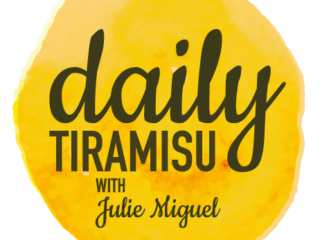 Julie Miguel is a digital content producer with a specialization in food media as well as an active food blogger. 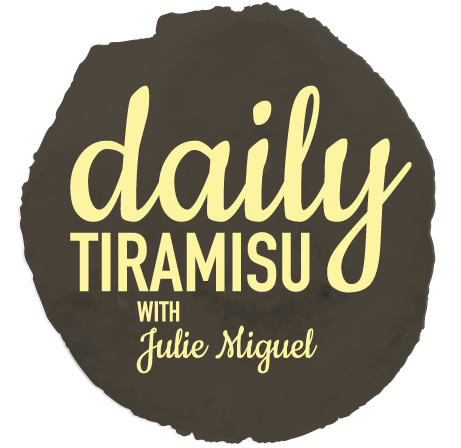 The focus of her blog, Daily Tiramisu, is to empower home cooks to be fearless in the kitchen and she does this by taking traditionally difficult recipes and making them easier to execute.